Simply put, La La Land is empty calories. The film is a beautiful confection of color with huge amounts of artificial sweetener added to hide the rather stale ingredients that constitute the story. The resulting concoction produces a sugar rush of excitement initially, but the effect wears off well before the end of the 128-minute runtime, leaving viewers logy and dispirited. But not to worry as director/screenwriter Damien Chazelle provides a crash course in cliches. 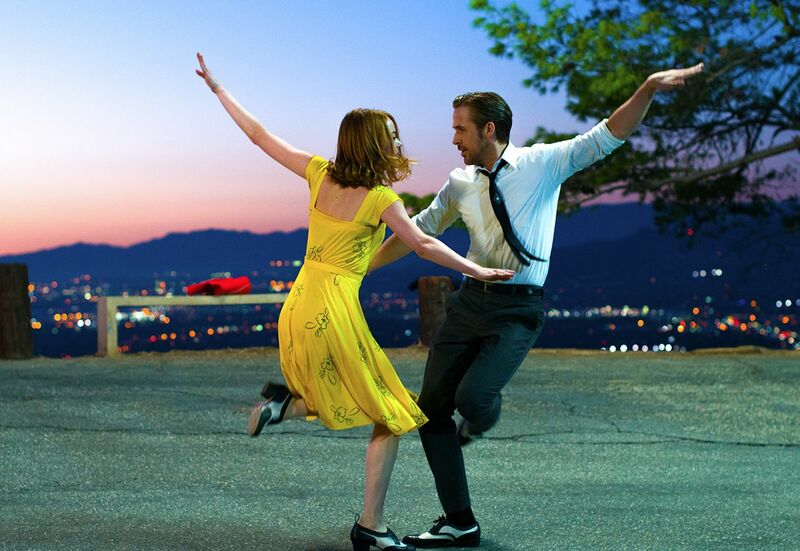 Even if you have not seen a single musical from the 1950’s, you will still feel as if you have seen them all by the conclusion of La La Land. Not to overstate – the film is too technically proficient to be considered a bomb. The cinematography, editing, and art and production design are fantastic. The movie dazzles when you don’t have to think about it. Unfortunately, the plot keeps getting in the way of that. It is unclear whether a different pairing at the top of the bill could have pulled this off, and it is equally unclear what possessed someone to cast Stone and Gosling as the singing, dancing star-crossed lovers. The best thing one can say about Gosling’s singing is that it’s not as bad as Pierce Brosnan’s in Mamma Mia!, although it does sound like he is struggling with a hairball during some numbers. Stone fares better vocally, although it would be fascinating to find out if it’s actually her voice or that of Baraka May (credited as Singer) that we are hearing. As for the choreography, it acknowledges the limitations of the leads. Chazelle’s last feature, Whiplash, was silly as well, but it was so damn entertaining that you didn’t mind. The filming of the jazz band scenes and J.K. Simmons deliciously over-the-top turn as the Full Metal Jacket drill sergeant as music teacher were enjoyable enough that no one begrudged its undeserved nomination for Best Picture. Perhaps lightning will strike twice for Chazelle, but the early accolades for the film coming from the festival circuit have an emperor’s new clothes feel to them. It will be interesting to see if the positive support is maintained once La La Land hits U.S. theaters in December. It is supposed to be unique and artistic. Does it seem newer than other musicals? No need to apologize – most reviews have been extremely positive. It just didn’t work for me. I would encourage you to see for yourself!